In a conversation I had recently with Wicked Bears’ bassist/vocalist Casey Keele, he talked about how much great music is coming out these days and how overwhelming it is to really listen to and absorb all of it. I know this feeling all too well—in today’s age, the amount of information being hurdled at us at an intense velocity on a daily basis becomes so much for our human brains to handle. As a music writer, I’m constantly being exposed to new bands and music across the country, and even the world. To give an album an accurate review, it requires multiple listens to fully take it in. Plus, if the album in question is not “doing it” for me, then my dream job can easily become a curse. That all having been said, blessed am I that Wicked Bears’ self-titled debut is only six tracks long and that each is more engaging than the last. 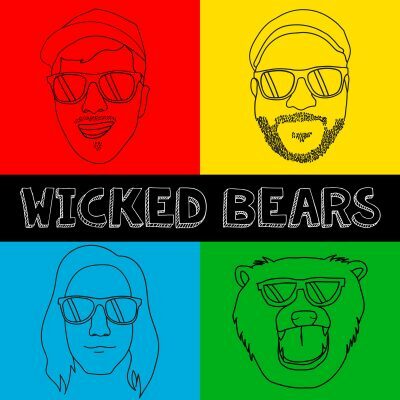 Wicked Bears have a sound that closely resembles the angst-driven, pop-punk revival that crosses streams with old-school emo music. That means we’re in for some melody-heavy guitar riffs, catchy pop hooks, lyrics of heartbreak and cynicism and often some pretty dark humor to even it out. “Nothing But Time” delves into some modern-day existentialism: “I’ve been standing here for 15 minutes and I don’t know what I want / I could stand here another 25 years and still won’t know what I want.” “The Weekend” takes a jab at living the 9-to-5 life and how, for five days, we are just waiting for that two-day break, only to do it all again (your experiences may vary): “The weekend comes and goes; it’s the punchline, you’re the joke / and Sunday’s forcing Monday down my throat.” Then “Do You Remember?” gives the most anthemic chorus of the EP: “Do you remember signing up for this? Because I don’t, I don’t, I don’t!” which gets the most points for crowd participation when played live. I didn’t even know the lyrics when I first saw Wicked Bears play it, but by the last chorus, I was uncontrollably singing them as if I had done a million times before.